A few weeks ago I picked up this Mega Bloks Police Cruiser Standoff set (#97452, 224 pieces). 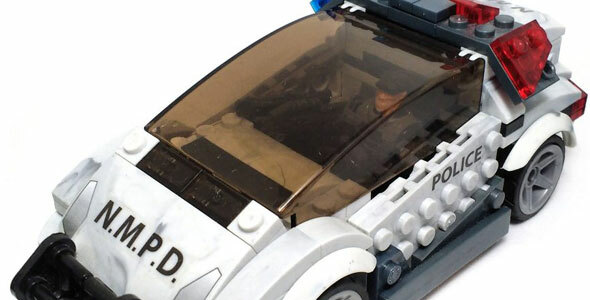 This is a medium-sized box set consisting of a patrol car and a couple minifigures. Well, one of my guilty pleasures are blind-packaged minifigs. And there is a good deal to choose from, from LEGO to the more varied Megabloks offerings. Unlike the rest of the alien species that conform the Covenant in the Halo Universe, the Kig-yar (the species Jackals and Skirmishers belong to) are different in the sense that they didn’t join the fight against Humanity because of their religious beliefs, but rather because they were at first bullied into the conflict and afterwards because they found it to be very profitable. In the Halo games, Grunts are a type of enemy you’ll see a lot of. Individually, they are not much of a challenge, but in the presence of a leader-class character and in sufficient numbers, they can be quite a challenge. Following the covenant rank system, most of the Grunt troops are labeled as Minors and are easily identifiable in the field by the color of their gear. I don’t buy toys from McFarlane all that often, because for a time they focused more on producing statuettes rather than action figures, and the quality of their materials was rather poor, despite sporting stellar sculpting and great paintjobs.